Twister Edge W is an extremely versatile skate and changes the game once again for urban skating with a new design, fit and level of versatility to continue its reign as the benchmark skate in the urban skate world. The shell, cuff and liner work together to create a superior anatomical fit. The sole is designed with an Anti Torsion Box so skates are more efficient with increased control and stiffness. The 243mm frame and Supreme wheels provide superior control and speed. 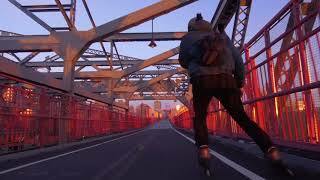 Molded skates are great in any urban environment, trail or secret skate spot one may have. Some may be thinking "Why should I skate the Twister Edge W and what is good about the boot and wheels?" It is one of the most compelling combinations of fit, support, speed and maneuverability. The brake comes in the box. - ENHANCED WRAPPING SHELL features unbeatable molded support to hug the feet. The cuff has a V-cut shape which adds versatility and more flexibility for slalom skaters and women.